Tree Root Cleanup in Frome. A tree’s roots are there for a lifetime and it’s important to make sure that they are kept in the right condition of which nature gave them, otherwise the tree will reflect the health and presence of your business, and will overall make the environment look uncared for. Downlands Tree Surgery offer expert tree fertilisation and mulching services to local businesses and home owners in Frome, with over a decade of experience with tree care and root cleanup – we have been involved in a range of different projects, all of which have had different requirements. If you are looking to cleanup your trees roots and to put them in the right condition to correct reflect the health and presence of your business in Frome, then get in touch with us to have a chat. Every tree has a rooting system, and the system is found in the top 100cm of the soil to be precise. In order for the tree to maintain itself and to be kept in good health, every tree will need a well structured soil system, full of nutrients, minerals, water and of course, oxygen. 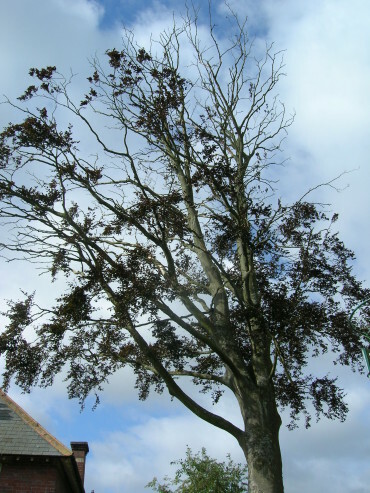 Any root disorder which a tree has – for example, from soil being compacted by heavy foot or vehicle traffic or machinery – will show up in the tree’s extremities in the form of dieback at the crown tip, yellowing foliage and small leaves. You can see from the picture on the right, the effect of soil compaction on this mature beech tree which was in Frome. The team at Downlands Tree Surgery (Frome Tree Cleanup) have expert knowledge and experience of tree biology, which helps us treat a tree’s rooting system correctly and with the right approach, the current application of the right fertiliser and mulch to build up the soil’s organic matter, minerals and nutrients. Saves you the cost of drastic remedial action or removal in the long-run. If you are interested, please get in touch with the Downlands team and we can discuss your Frome project further. Downlands Tree Surgery provide tree surgery and arboricultural services across the South of England, including Frome, Bath, Warminster, Chippenham, Wells, Trowbridge, Street, Corsham, Devizes, Swindon, Shaftesbury, Wincanton, Gillingham, Mere, Marlborough, Pewsey, Amesbury, Salisbury, Andover and other locations.